Compared to Asian countries, it is pretty easy to travel Vietnam on a tight budget, and as a consensus to visit Halong bay, a must see destination in Vietnam. 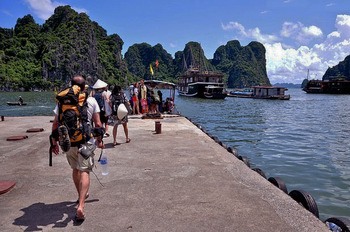 As Halong bay is recognized as a world heritage, it is no doubt that many travel companies organize tours to Halong bay, ranging from high class choices to budget cruises with all sort of starting prices to expect. In principle travellers are not recommended to go for cheapest offers if you want to have a decent trip, there are many tour agencies in the old area of Hanoi offer dirty prices of just 50 usd, stay away from these cowboys as you may ruin your Halong bay tours. Take your time for a survey around the net and you will find what suitable for you. For a cheap and cheerful service I would advise Amigo cruise, an online tour company in Hanoi, you will not get a luxury but it is alright and possibly meet your budget condition. It cost around 150 usd for a 3 day trip, this is cheaper than most cruises but I wouldn't recommend going much cheaper (not that cost necessarily equals quality in this area). Make sure you do your homework on this if you are going to commit to doing a tour, as there's a of advice that will help prevent you from experiencing some of the pitfalls that can be experienced like have the supplier write down the itinerary for you with what is and is not included. And, cheap price is not always bad. Some time, you can find more exciting when you travel with young person going budget tours. You have time to sing, dance, swimm and kayaking... more noisy with the youth. From our experience, it would be better for you to book it after you come to Hanoi as there is an unlimited amount of options, and you can get a 1 day cruise, includes return transfer by us, lunch on board and 4 hour cruise with the stops, and 4 hours each way on a bus from Hanoi, all for about 40 usd, if you want an overnight tour in Ha Long Bay either on a boat or at a hotel, add 50 usd per person for the budget option. Keep in mind that the nicer the hotel the more it cost , the smaller the hotel the cheapest options they will have. Also remember when you go on the tour drinks are at extra charge.